Probably one of the most famous Disney food scenes out of all of the animated movies. The spaghetti kiss. We tried recreating the famous scene, but our dog wasn’t as willing as Lady. All-in-all, Lady and the Tramp had a good haul of food. And our greyhound loved the food too. Toward the start of the movie, Tramp was looking for a good place to eat, before settling on Tony’s. One of the options is a cake shop. In a bowl, mix 1st 3 ingredients. (see notes below) Set aside. Place remaining ingredients in mixer bowl then add the dry. Mix on low speed for 30 seconds, until dry ingredients are incorporated; mix at medium 2 minutes. This makes 1 & 1/2 times the usual batter than a ‘straight’ cake mix. It will fill one of the following pans: 8″ sq; 12″ round; 9x13x2; OR one 10″ and 6″ round. Pour into pan(s) and bake as you usually do. I prefere to bake at 300 degrees F. for 20 minutes, then turn oven up to 325 degrees F. for an equal time OR until you can smell cake If it has pulled away from the edges of the pan it is *over done*. You should have a flat cake that won’t (usually) need leveling & is not sticky on the top when it cools. There is NO oil, butter or margarine in this recipe. If almond extract (not emulsion) is used, add 2 teaspoons or to taste. Can use ANY cake flavor. Flavorings can change depending on cake flavor you use. Try a combination of 1 part vanilla, 1/2 part butter flavoring and 1/4 part almond. It is important to mix the dry ingredients well especially if using a chocolate mix or you will have white spots in the finished cake. I use a wire whisk. Disclaimer: DO NOT feed your dog donuts and coffee. Caffeine is toxic to dogs. But that didn’t stop Jim Dear. While having his morning coffee and donut, he decided to give Miss Lady some. Even though it’s a bad breakfast for dogs, it’s a perfectly good breakfast for humans. We found a great donut recipe that fits the time period of the movie well. One egg, one cup of sugar, two tablespoons of butter, beaten together till creamy. Add one cup of sweet milk, a pinch of salt, two teaspoons of baking powder stirred into two cups of flour*. Add one-half teaspoon of ginger and one-fourth teaspoon of nutmeg to the flour. Beat well, roll out about one-fourth of an inch thick. Cut out all the cakes before beginning to fry. Cook in deep fat that will fry a small walnut-sized ball of the dough in about sixty-five seconds. Do not let the fat get above that degree of heat. *NOTE: I don’t know if I messed up the recipe or what, but I had to add about double the flour asked for. 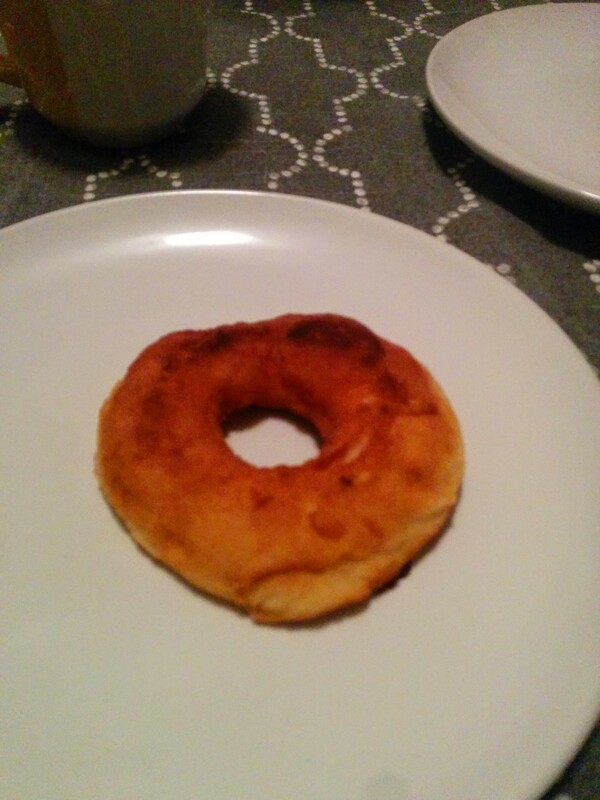 The dough was too sticky to shape so I just added more flour until I could shape the donuts to fry, which I used 2 different sized lids to make the circle shape and the circle hole. :Poor Lady didn’t get a chance to eat the juicy steak she envisioned. Even though Lady wasn’t a fan of the peas, our greyhound loved them. For the Rib-eye steak. I salted the meat beforehand, and then threw it on the grill until I got a medium-rare cook. The mushy peas recipe is as follows. Bring a shallow pot of lightly salted water to a boil over medium-high heat. Add frozen peas, and cook for 3 minutes, or until tender. Drain peas, and transfer to a blender or large food processor. Add cream, butter, salt and pepper to peas, and process until blended, but still thick with small pieces of peas. Adjust seasonings to taste, and serve immediately. Now, the moment you’ve all been waiting for, the famous spaghetti and meatballs. Its such a beautiful scene on a bella notte. We tried to recreate the scene with our dog, but Roxie wasn’t so sure about sitting at the table. We did manage to get a semi-decent picture. Reduce heat and simmer, uncovered, for 1-1/4 hours. Meanwhile, soak bread in remaining water. Squeeze out excess moisture. In a large bowl, combine the bread, eggs, Parmesan cheese, parsley and remaining salt, garlic and pepper. Crumble beef over mixture and mix well. Shape into thirty-six 1-1/2-in. meatballs. Place meatballs on a rack in a shallow baking pan. Bake, uncovered, at 400° for 20 minutes or until no longer pink; drain. Simmer, uncovered, until heated through, stirring occasionally. Serve with spaghetti with additional Parmesan if desired. Accompanying the spaghetti is a bowl of breadsticks. Mary had made this recipe before, so we decided it would be good. However, when I made it, the bread turned out too sweet. I’m not sure why. So just a forewarning while making it, maybe add a little less sugar. Roll out on parchment paper to the size of a cookie sheet. Will you call it a bella pasto (beautiful meal)? Overall the recipes were good. I was a little tired and out of it when making the spaghetti and meatballs. I would have made the meatballs a bit spicier if I were on my game, and probably used bread crumbs as opposed to soggy bread. But they still turned out pretty good. The donuts and hot chocolate were a great pairing. Part of a balanced breakfast. And the cake was amazing. We got lots of compliments on that. I highly recommend it.